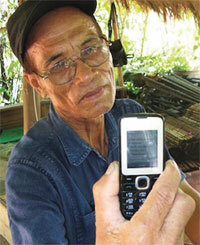 Cell phones have become indispensable for jasmine rice farmers in Yasothon province of Thailand. This is because of a service that provides regular, precise weather alerts to help farmers prepare fields and manage water. Farmers in Yasothon, one of the poorest provinces in Thailand’s northeastern rice bowl, depend solely on rainwater. The alerts are part of a scheme initiated two years ago by EU-funded Community Weather Forecast Centre (CWFC) to help farmers cope with climate change. CWFC connects farmers to a network fed by a Bangkok-based agency that uses satellite-supplied information to make specific predictions. “Micro-level weather information is what farmers prefer at a time of erratic rain and drought conditions,” Suwanasart Konbua, head of the Climate Change Knowledge Management Centre, an affiliate of CWFC, told IPS.